Cover the flower head with a paper bag and secure into place by tying around the bag with a string. Hang the cut sunflower upside down by the stem in a warm but ventilated area for three weeks to two months while it cures. The seeds will fall out over time, caught in the paper bag. 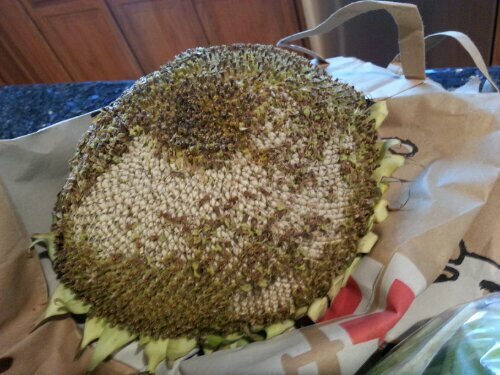 Place the dried sunflower seeds in an airtight container in the refrigerator for storage. Roast the sunflower seeds by spreading them in a flat layer over a cookie sheet and placing in a 300-degree oven for 20 minutes. Add salt or leave them plain based on your preference. I love the decorative stuff because they can hang around until Thanksgiving and not be confused with my Halloween decorations. “It has been a challenging year for us – drought, heavy insect and disease pressure, crazy weather (including about three weeks without sunshine due to wildfires). Despite these difficulties the basket went out every week full of fresh produce. The variety, due to problems noted above, was not up to our usual standards – lots and lots of some things and less of others. Thanks for putting up with those variables. We are changing the basket substantially in 2014 to ensure we can send a full basket of good produce every week, despite the challenges we anticipate due to continued drought. Luckily at Lattin Farms we have storage ponds on the farm and will be able to plant for the new seasons we are implementing for 2014.
of the summer squashes, tomatoes and peppers. Late Season Basket will include August and September and will contain all the crops you got this year. This will allow us to concentrate on our major season as we face the challenges with weather and drought. Our sign-up for 2014 will be up on the website within the next couple of weeks and we would appreciate early sign-ups with the $50 deposits as we may be required to limit basket numbers if the drought worsens. Well, that’s just how it works here in the desert. No water, no life. You have to do the best you can with what you have so we’ll see how it works out next year for crops and Fresh Veggies in the Desert. Let me know what you think … I was looking forward to the winter break but now it’s a little sad that I’m watching the CSA change at the same time. 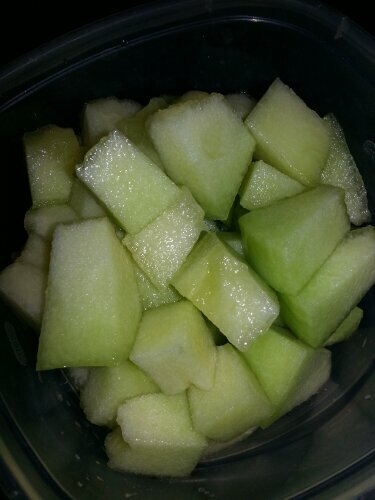 Summertime is all about fresh melons. 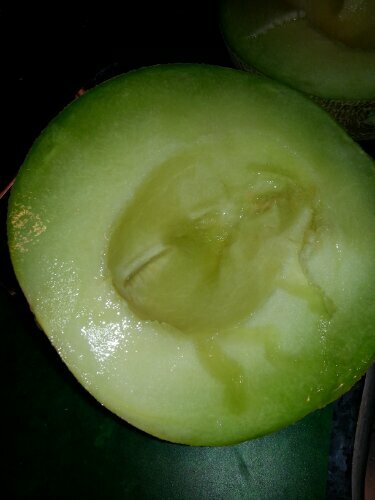 Cantaloupes, watermelon, honeydew … and, now, GALIA. 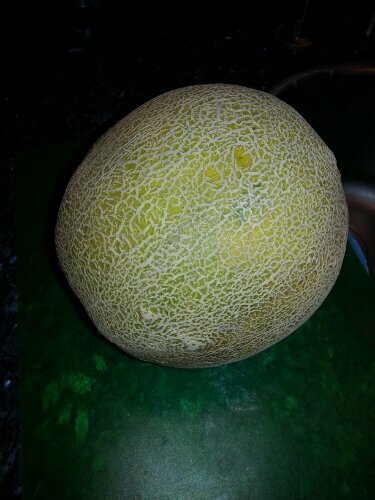 This cantaloupe looking treat was a new one for me but I knew right away that it was going to be wonderful. 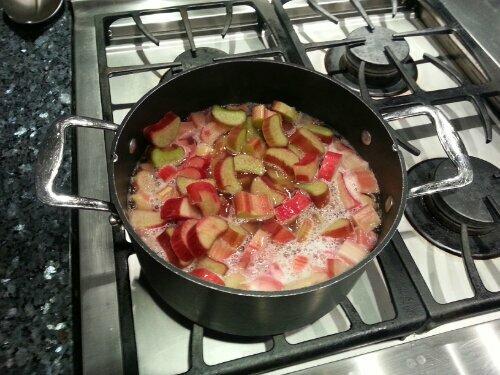 When you can smell the sweet goodness of a fruit right away, you know it’s gonna be great. Interesting. All I know is that my taste buds liked it. I’m a little freaked about how seeds/plants are developed and bred but I trust my Lattin Farms to grow it organically so, I’m going to not think to hard about this. 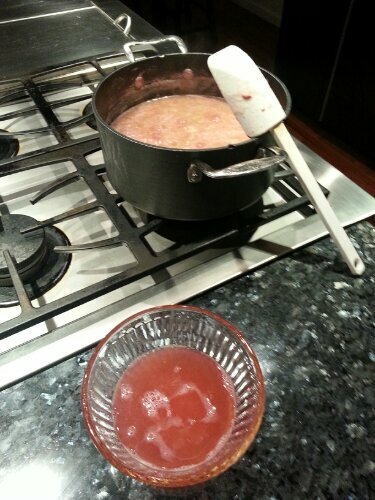 The taste was a mix between cantaloupe texture and watermelon flavor with a little bit of a different tang. Really good. This was one of the first things for me try out this week’s veggie box. I’m so happy to be back with Lattin Farms! 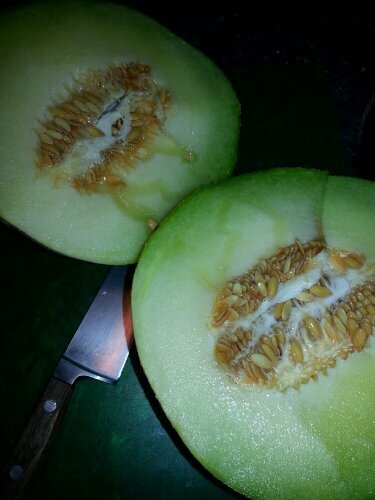 Have you ever had a Galia melon? How do you feel about how plants are modified/bred/etc? I’ve been doing more research about GMO stuff but I’m not sure how I feel about it right now. 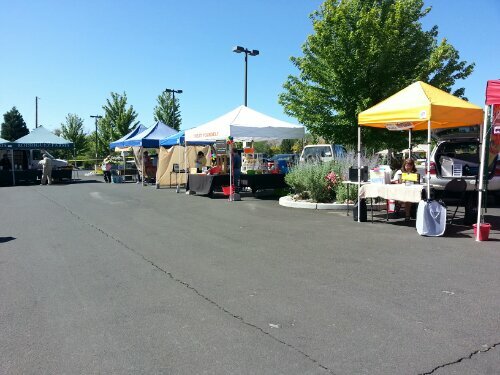 Welcome to what Northern Nevada calls a “farmer’s market.” On any given day of the week, there is a parking lot somewhere in town with at least four or five booths set up and a display of fruits, veggies or etc with a big FARMER’S MARKET sign waving in the air. Yup. It was pretty crowded that day. That being said, the fruit selection at this little ditty was pretty nice. There were lots of free samples available and, yes, I did buy several things. 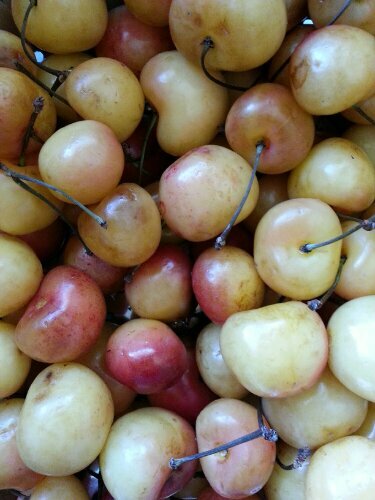 This week was all about fruit: Rainier cherries, pluots, plums and peaches. Mmmmmm. Sweet goodness. 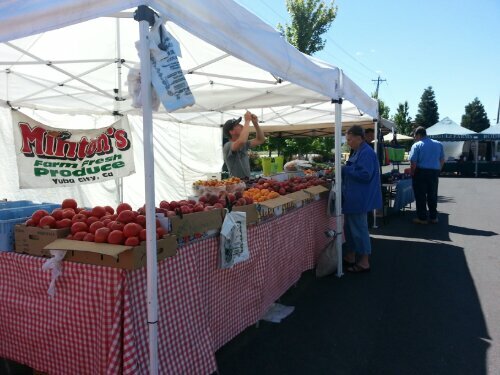 Do you have a local farmer’s market? Is it in a casino parking lot, too? Hmmm. I didn’t think so. 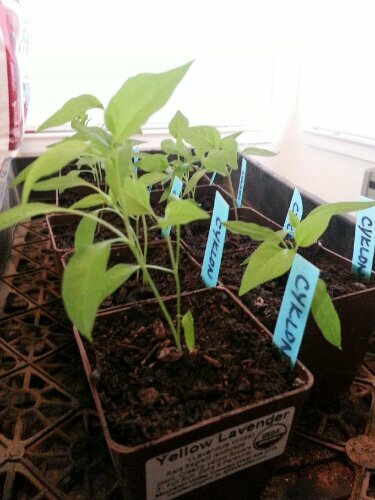 Last year, I took up an offer for some free pepper seeds. Not just ordinary old seeds from any store or even specialty seeds from the overpriced home garden shop, I got seeds from a fellow blogger. Blogmeister, if you will: The Peppermeister. 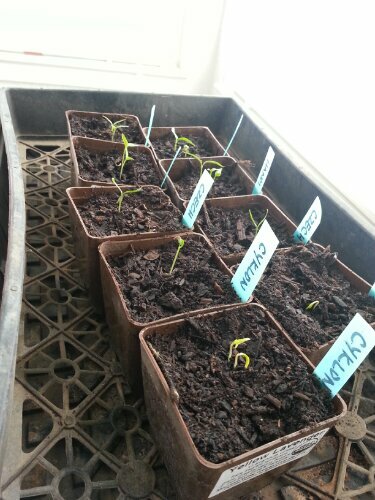 Sir Pep happily shared a nice bounty of pepper seeds and I have attempted to make them grow. Attempt is the key word here, people. Attempt. 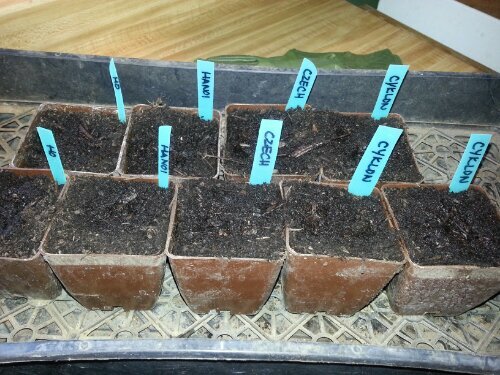 I was particularly proud of my nice little labels for all of the varieties that I was going to soon harvest. Please comment on how nice the labels are, it will make me feel better. 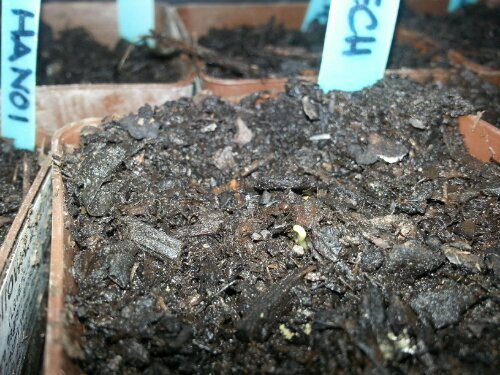 Take a look at my first born sprout. This is a magic moment in Pepperkind. Progress is happening … aren’t they pretty? 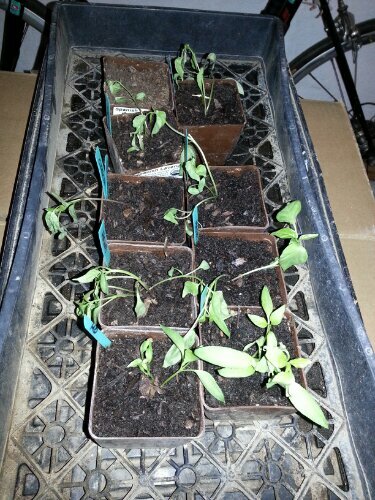 Here, my lovelies were growing nicely and the weather was getting warm so I decided it was time to migrate my seedlings to a protected area out in the yard. HONESTLY, I attempted to protect them. Attempt is the key word again. Ugh. Devastation. It was colder that day than expected and the direct sunlight was not kind. Dammit. 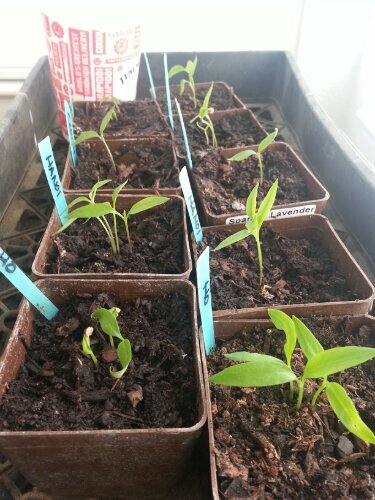 Well, a few survived and I’m still attempting to produce a few pepper plants. Wish me luck. I’ll keep you posted. One of the hardest parts of getting a big box of fruit is that you have to prepare or process it all before it goes bad. And, now that it is warmer here, it seems that the fruit ripens a lot faster. Yesterday was a fruit cutting day. 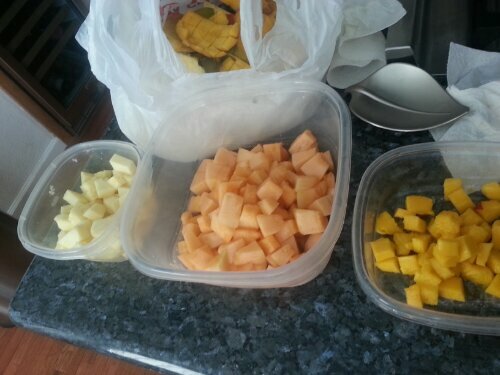 Pineapple, mangoes and papayas. Bountiful Baskets apparently gets a lot of fruit from Mexico. Pretty exciting, huh? Not. 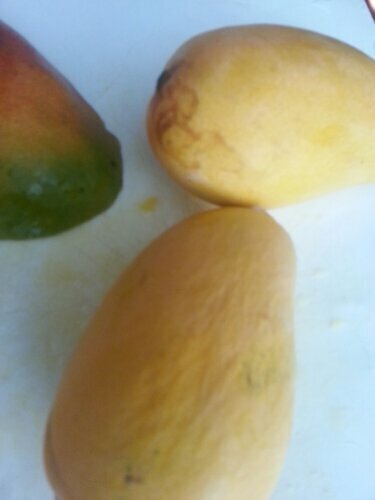 Well, I was all chop-chop-chop in uniform (hahaha) sizes until I got to the mango. Now, let’s clarify a bit here. 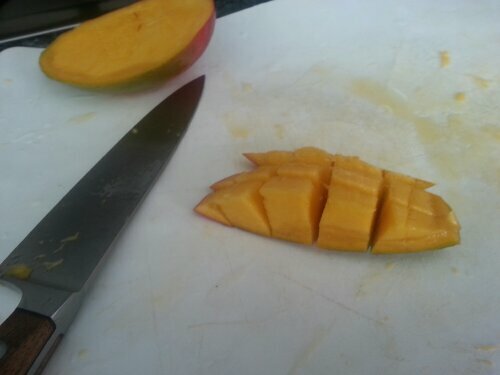 I like mango-flavored stuff and didn’t really think that cutting up a mango was a technical skill. Ooooh, how I was wrong. I didn’t know fruit preparation required Google instructions until now. Apparently, the pit thing on these babies is kind of weird. It’s not like a peach, for example. I was expecting this to be like an avocado. Nope. Whole new adventure. You kind of have to cut into it hoping to avoid the non-pit, hard area and then surgically remove the good fruit stuff from the peel. Mmmm-kay. Whatever. Then, there was my next mystery fruit. Clearly, these are not grown in Nevada. I had to ask what this is. I have been told that it is a papaya. 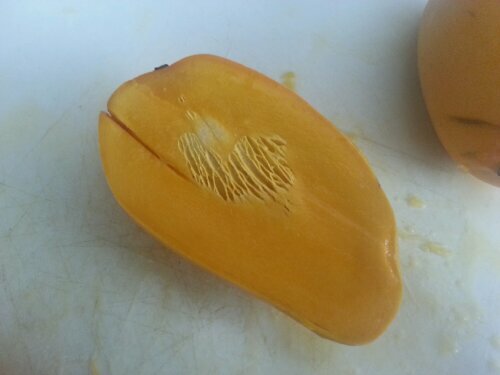 And, while I have eaten dried papaya and had papaya-flavored things, I had not cut a fresh one until now. This little sucker was worse than the mango. I have no idea what the proper technique is. 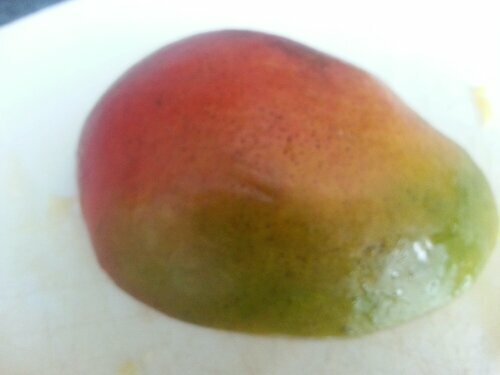 But, I kinda adopted the mango-method and then peeled it with a paring knife. I ended up with tiny (yet tasty) bits of sort of smashed papaya. They will taste good IN something but not so great to just eat on their own. This is a closer look at the non-pit thing. What the heck? You can’t just easily separate it from the fruit part. 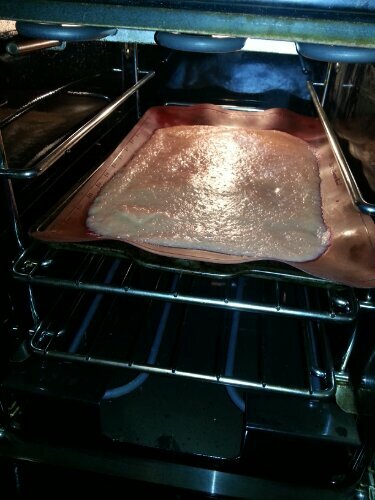 Maybe, I should check Pinterest. I dunno. Anyone have some good tips on dealing with these tropical babies? Magic peeling wand? 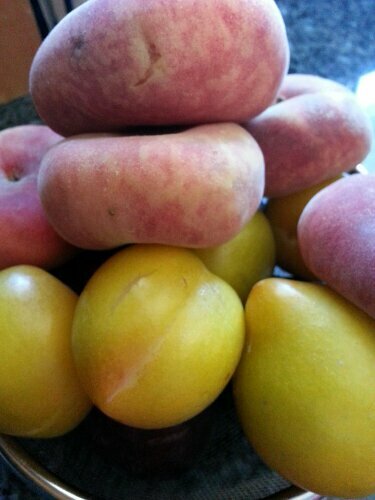 Is there a uni-tasker for papayas? This week was my first Bountiful Basket. I am so completely impressed. This is fantastic! Easy, affordable, convenient. All of the things that I love! AWESOME! What’s a Bountiful Basket? It is a food co-op. 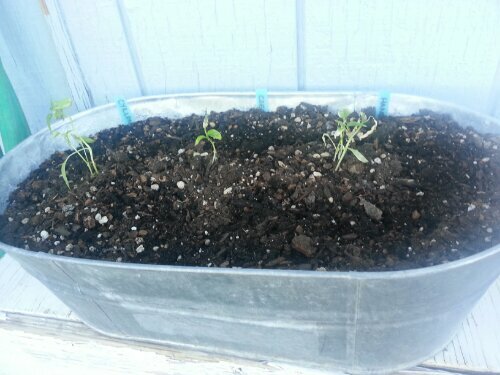 Now, to be clear, this is very different from the fruit/veggie box that I blogged about last year. 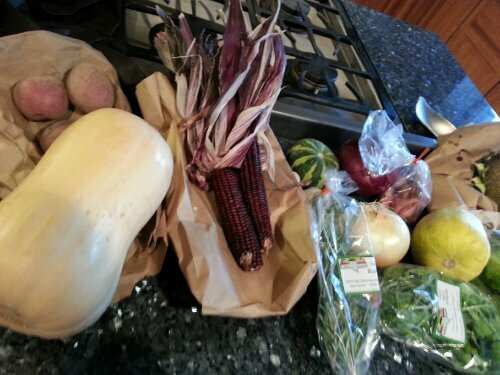 This is not a community-supported agriculture subscription and it is not just local. Each ‘basket’ is a share of the fruits and vegetables (or other food items) that the co-op could purchase with a group of contributions from the members. Membership is free but you do need to sign up in advance via the website. The Bountiful Baskets organization is a non-profit, national organization so check their website to see if there is a location near you. In case you are not paying attention, there is a ton of stuff here. 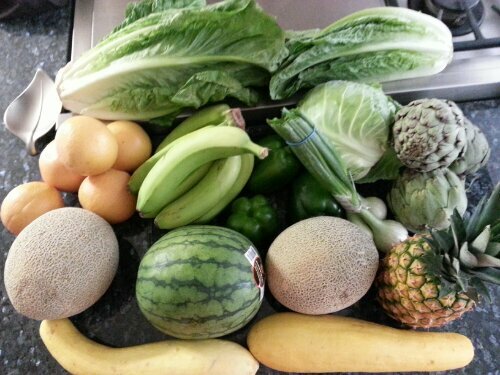 I’m talking two super large heads of romaine lettuce, grapefruits, bananas, green onions, bell peppers, artichokes, cabbage, yellow squash, cantaloupes, watermelon and a pineapple. 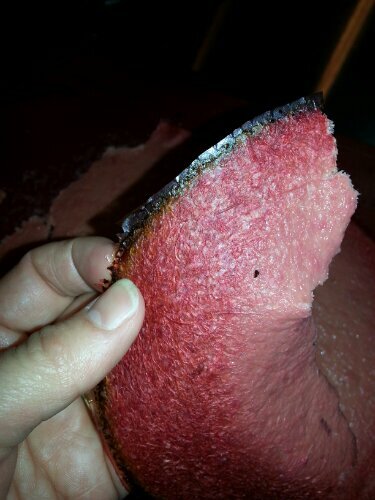 The bulk of the fruit appears to be from Mexico. 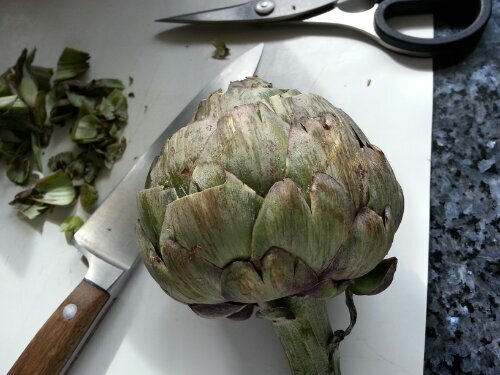 I got the impression from the website that some of the produce was from Arizona and California as well. This gigantic vat of coconut oil was $18.50. I have seen considerably smaller containers for more at my local store. 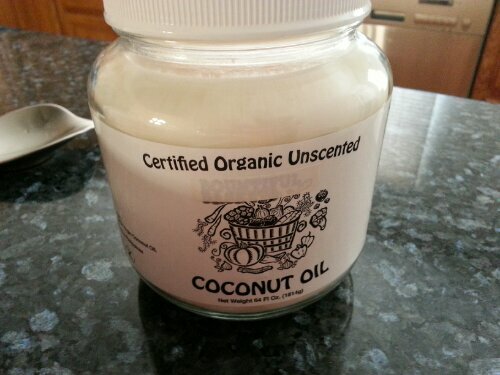 What do you do with coconut oil? Cook with it. Use it for your hair. Make sunscreen. All kinds of great stuff. It’s supposed to be good for you, too. Google it. 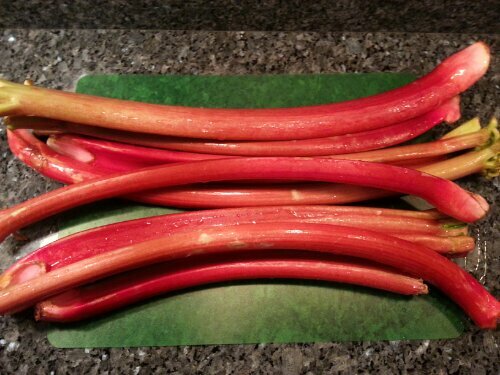 And, I couldn’t resist some rhubarb. This huge bag was $5.00. 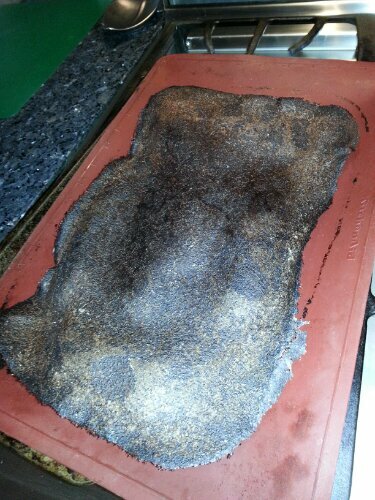 Now, to decide what I’m going to do with it. Any suggestions for something different other than pie or jelly? 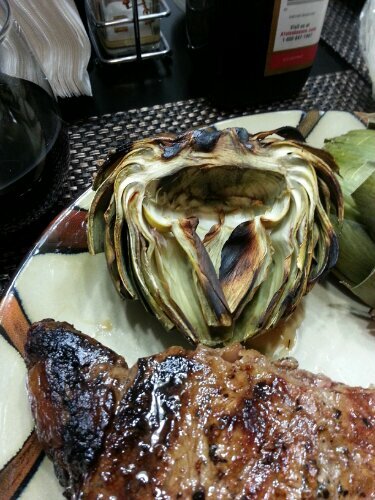 I’m thinking it will go great with the pineapple or maybe, even the grapefruit. 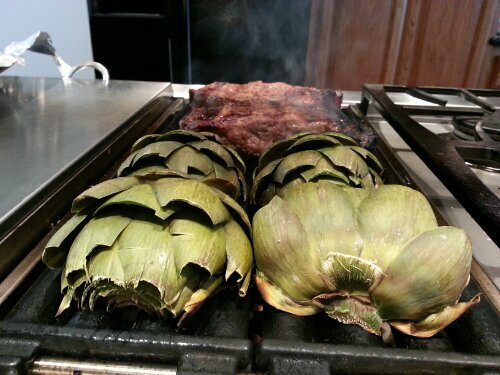 Overall, I’m really happy with the quality of the produce and I love the ease of ordering. The baskets are every other week and, if we are going to be out of town or something, you don’t have to participate every time. The volunteers at the pick-up point were really friendly and there is a Facebook group for my local area where people share recipes, etc. The only bad thing that I can think of right now is that I’m missing the “Know Your Farmer” aspect that I had last year with Lattin Farms in Fallon, NV. But, I still love them so I know I will make a special trip to their food stand soon enough. Bountiful Baskets won’t steal me that completely from them. Let’s hear from you — what do you think? I think I may have found a new veggie basket for this year. 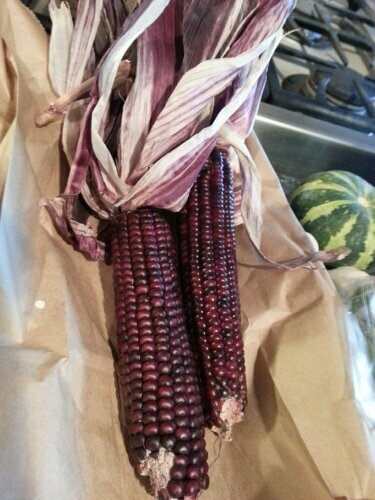 Since moving to our new house, I have debated whether or not to do the CSA this year and just wanted to try something different. Tada! The solution fell right into my lap the other day when I discovered that there is a food co-op that does a fruit and veggie basket right in my neighborhood. Wow! How convenient?! 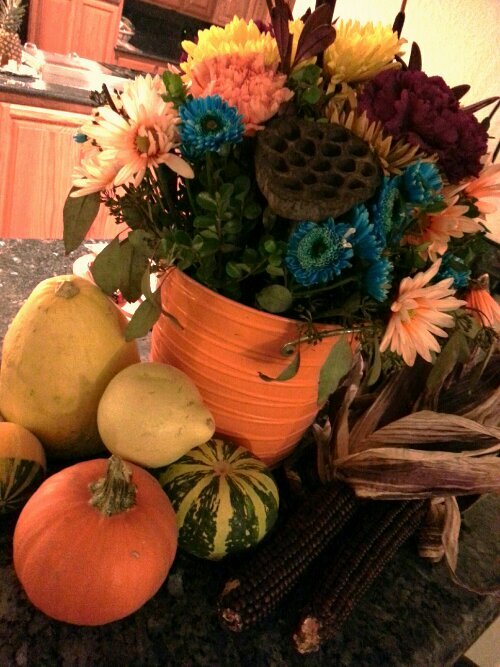 “We hope you enjoyed your experience with Bountiful Baskets Food Co-op (BBFC). 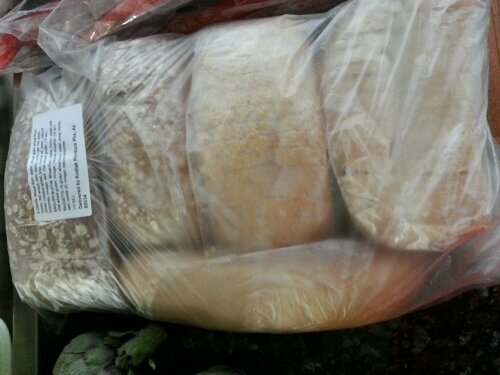 BBFC distributes produce baskets, organic produce baskets, artisan bread and sandwich bread every other week. BBFC is a group of people who work together for mutual benefit. This is a grassroots, all volunteer, no contracts, no catch co-operative. Since there are no employees at Bountiful Baskets, we as a group pay rock bottom prices on your food. This also means the co-op would not happen without volunteers. If you are interested in the co-op continuing, please volunteer occasionally. All it takes is a little time, energy and a smile. Volunteer opportunities include helping prepare the baskets, breaking down boxes, assisting with the distribution, and packing up. To help out, simply arrive an hour early dressed and ready to work with water to drink. The deal is that you go to their website every other week to opt-in and then volunteer every so often to help out with the distribution. OK. I can handle that. 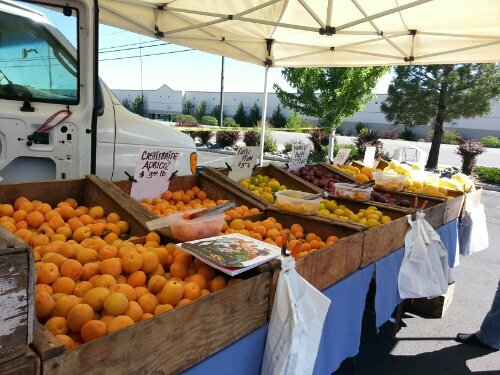 This week’s offering included extra add-ons like two different bread packages, coconut oil (1/2 gallon expeller pressed in a glass jar for $18.50), granola, a guacamole kit, 8 lb flat of strawberries, 4 lbs rhubarb or a 40 lb bag of valencia oranges. 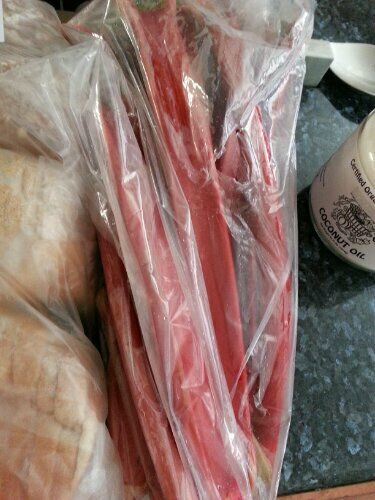 I opted to try the bread, coconut oil and rhubarb. Keep your fingers crossed, Fresh Veggers. I hope this is as cool as I think it’s going to be! I’ll post an update this weekend. Pickup is on Saturday! Has anyone else out there tried Bountiful Baskets? Leave a comment, please. I would love to hear about your experience. P.S. I’m waiting to see how this first week goes before I figure out the volunteering portion of the deal.